The sound of fireworks was replaced by the mechanical buzz of chain saws and wood chippers last Friday as residents cleaned up the debris from a string of violent thunderstorms that blew through the area on the eve of the Independence Day holiday. The storms wreaked havoc on portions of the area, particularly North Granville, Hampton and Poultney, Vt., as straight line winds snapped trees and utility poles in half and brought down power lines, leaving some residents without power for two days. Wind gusts of nearly 70 miles per hour were reported in Poultney, Vt., and along Route 4 in Rutland (Vt.) County. New York State Electric and Gas reported more than 2,500 people in Washington County lost power during Thursday’s storm including nearly the entire town of Granville and Hampton and Green Mountain Power reported 2,000 people without power in Poultney alone. Route 30 in Poultney was impassable due to downed trees and many of the roads leading into and out of Hampton were closed Thursday. “It was a disaster area. We got hit pretty hard,” Herb Sady, Hampton highway superintendent said. Sady said a handful of residents were stranded on roadways during the storm. 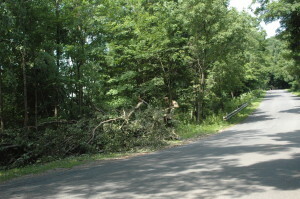 The northern end of South Road was hit particularly hard with power poles snapped in two and a 4-foot in diameter locust tree blocking the road. Hills Pond Road also suffered lots of damage. “We had to cut our way through,” Sady said. He estimated upward of nearly 100 trees came down on or near local roads. Eric Towne, highway superintendent for Granville, described damage in North Granville on Dekalb, Holcombville and Upper Turnpike roads. Towne said employees were out until midnight Thursday clear roadways and spent six hours on Friday morning cutting back limbs and cleaning debris. Similarly, Sady said employees spent most of Thursday night and early Friday morning clearing roads so that crews from NYSEG could try and restore power. Area fire departments also had a long night, responding the downed trees and directing traffic. On Friday, residents throughout North Granville cut tree limbs and picked up branches strewn about their properties. Some event lent their neighbors a hand. “You had neighbors hooking on to trees and pulling them out of the road. The whole community really came together,” Sady said. There was widespread damage to crops as winds ripped some plants from the ground and a burst of hail battered plants and fruit. Fortunately, no one was hurt during the storm. “That’s the best part; nobody got hurt,” Sady said.